Is there anything more romantic than a woman's vanity? 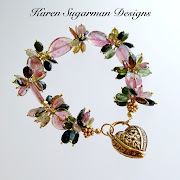 Full of beautiful perfume bottles, some old, some new, silver hand-held mirrors and natural bristle brushes, old cut crystal jars that hold lotions and oils - a vanity conjures up images of a daughter sitting on the floor, gazing up as she watches her mother put on her jewelry and fancy dress for a party that night. Vanities represent grown up femininity and many an adult woman now wants that fantasy in her life. Vanities through the ages were a staple for the upper class. 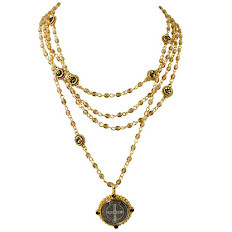 The style of the vanity changed with the fashion. Along with Louis XV and Louis XVI, Art Nouveau and Art Deco vanities are plentiful in antique stores. The fabric covered, skirted, kidney shaped vanity was popular in the 50s and peaked in the 60s. At that time, the vanity fell out of favor due to the rising use of built in cabinets. 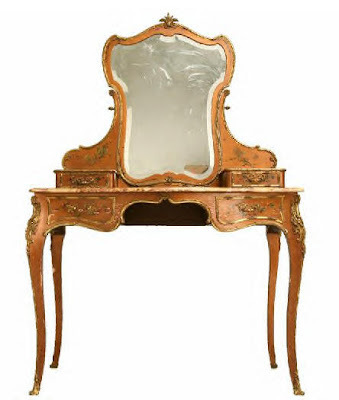 Today, there is a resurgence of the vanity, but not as a vital piece of furniture. 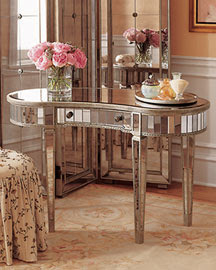 The vanity is more of an accent table placed in the bedroom or bathroom suite. 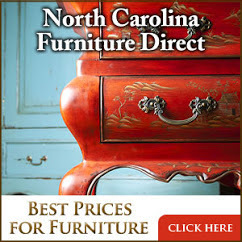 Catalogues such as Horchow Collection and Ballard Designs sell different types of vanities for the more budget minded. 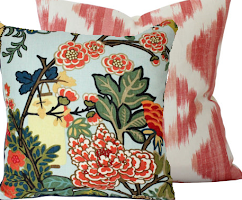 Currently, I am designing a bedroom for a 15 year old girl. 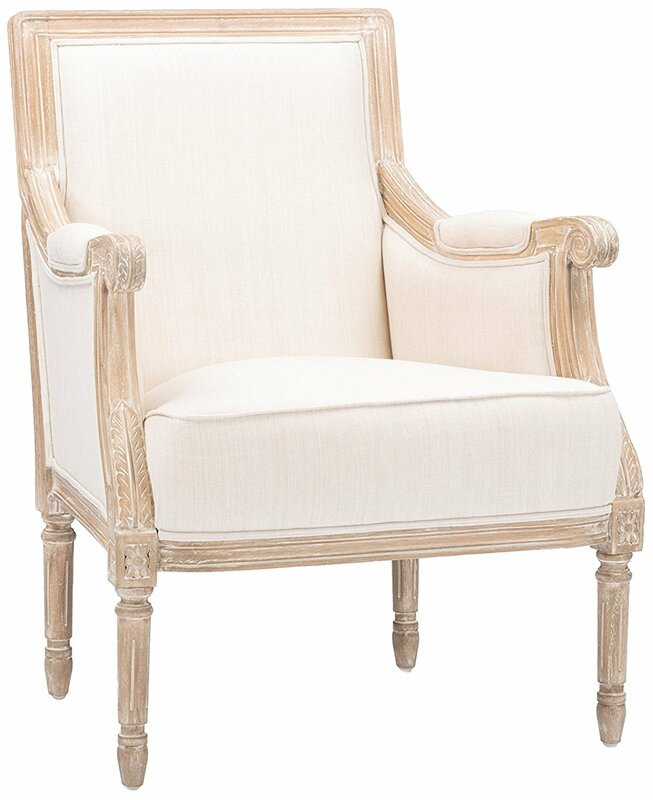 When asked what she wanted in her bedroom, the first item she mentioned to me was a vanity with a mirror and a chair. Her mother balked at this request, but I honored the teenager's wish and she will be getting her vanity after all. 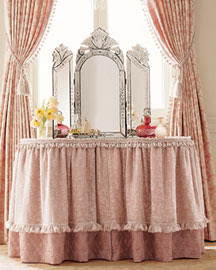 A modern vanity, accented with pink prints - this is an example of a non-working vanity. 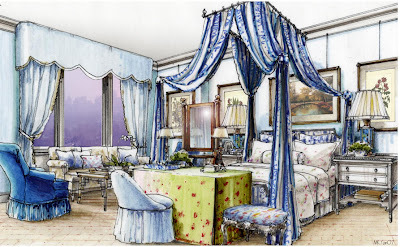 A rendering of a Charlotte Moss bedroom. 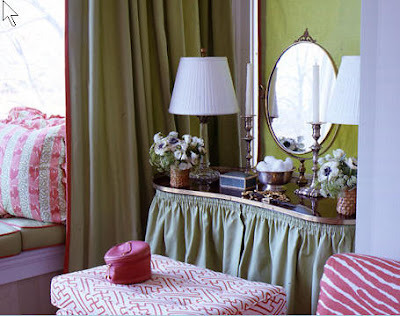 Skirted vanity is placed at the end of the bed instead of a bench. 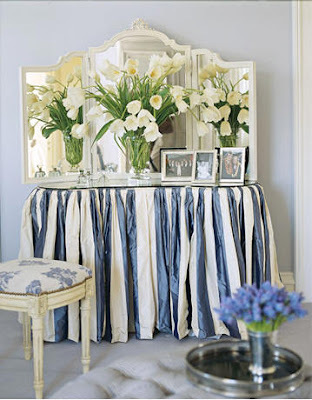 Mary McDonald places a mirrored vanity in a bathroom. 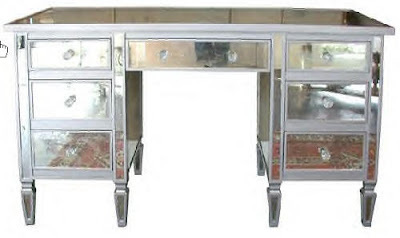 An antique writing desk doing double duty as a vanity in a French home. A built in that's been skirted to give the appearance of a freestanding vanity. 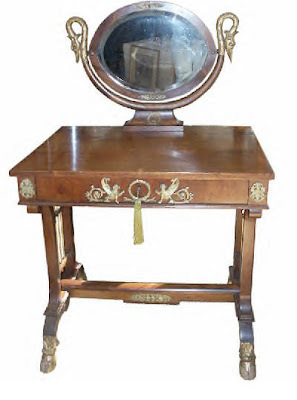 An absolutely gorgeous writing table, used as a vanity. 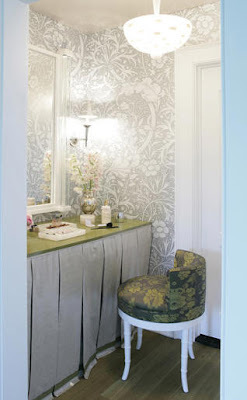 Californian designer Madeline Stuart places a vanity in the bathroom. What a beautiful setting to put makeup on, or just to look at family photos. 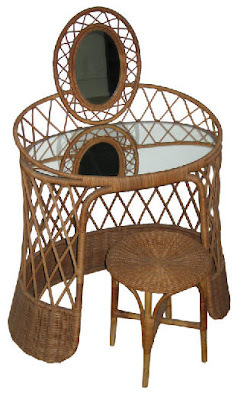 An unusual rattan vanity from the 40's. 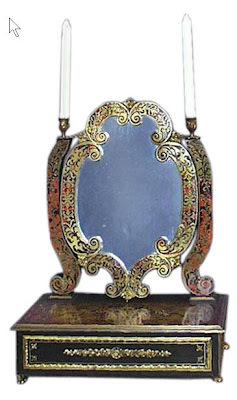 Very, very fine and expensive red tortoiseshell vanity mirror. 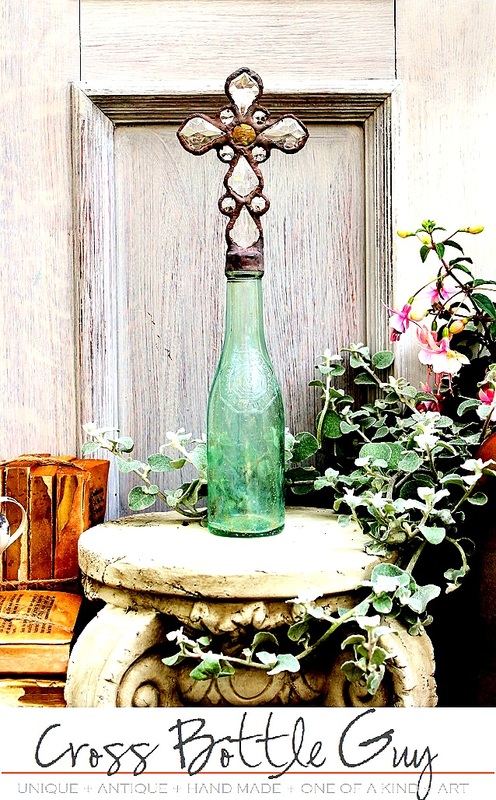 Note the two candlesticks on the top. 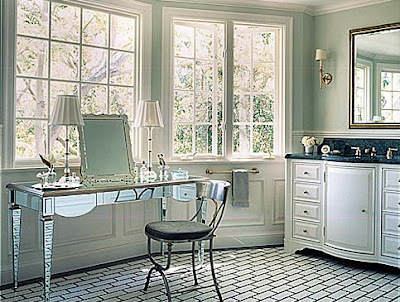 Mirrored vanity with Tiffany blue interior. Another mirrored vanity, practical with so many drawers. 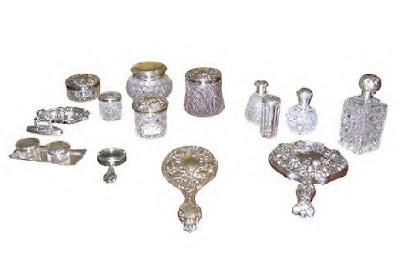 A beautiful array of sterling silver vanity brushes, mirrors and bottles. 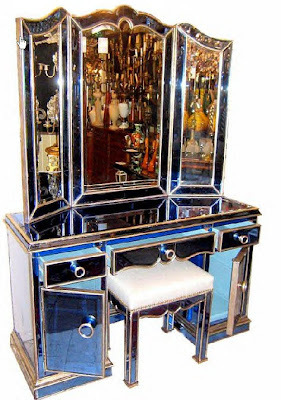 Art Deco mirror and wood vanity. Authentic English traveling vanity. Adorable. I LOVED these photos! 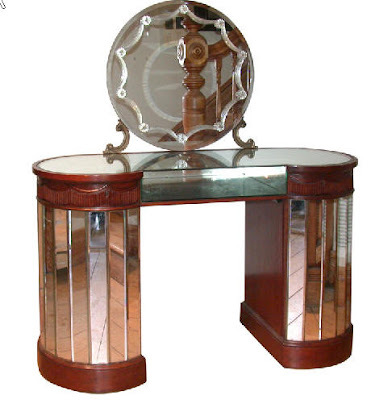 I have always had a dresing-table as we call them over here, in fact mine right now is a very cluttered mirrored one with an antique buttoned stool! Most people in the U.K. have them in bedrooms. 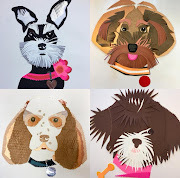 Fascinating to look at all these different styles!! Love this post! 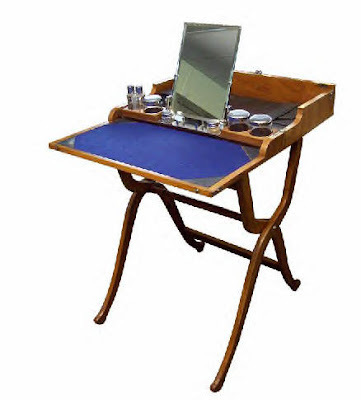 I always wanted a real vanity -- but I do sit at the one in the bathroom to apply make-up! Yes -- as Sophie mentions -- in England most women do have vanities! 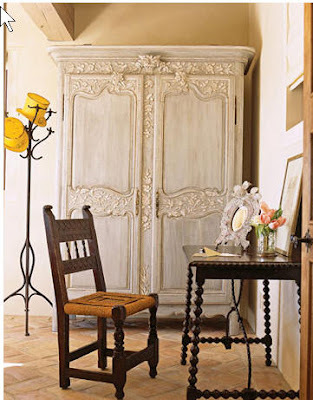 I recommend the three-section standing mirror and two tall buffet-style lamps on each side for best lighting -- as well as storage drawers underneath (of course!) and extra plugs for additional equipment needs! 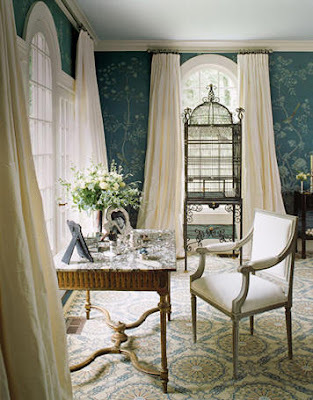 I am absolutely drooling over the rendering of the Charlotte Moss bedroom. Where did you find it? Are there more? I love the artists style, do you know who it is!!! 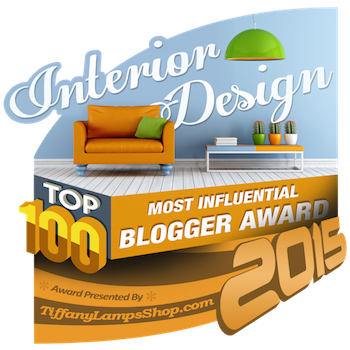 I have a whole chapter of my next book, The Design Directory of Bedding & Bedroom Furnishings, devoted to vanities and dressing tables, all covered in fabric of course. You found some really great examples. Thanks for showing them off. Wow, I almost didn't see this post. I had almost forgotten that I grew up with a vanity in my bedroom like the second picture. It was painted white and my mother made a yellow cotton skirt for it that had tiny flowers in white on it. It was a very special place to keep all my teenage girly treasures. I am so glad that you are giving your client's 15 year old daughter her own dressing table. That is about how old I was when I had mine. Thanks for the memories....I think i would like another one for the grown up me. Thanks for the comments! You just prove my point, grown up ladies want vanities! 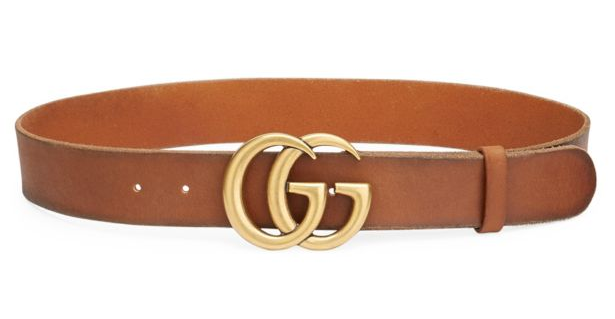 I want one too. I always wanted a vanity as a little girl. I googled for skirted vanity and found your post. I have a skirted vanity and love it. Cabinets and countertops offer the much-needed storage space in the bathroom to store your toiletries, keep medicines and first-aid box, cleaning milk, moisturizer and deodorants, towels and napkins besides other things that you use daily while showering in your bath. They are powerful accents to your bath décor and help you to define the tone and style of the bathroom wall cabinets and make the best use of the wall and floor surface of the area. http://bathroom-wall-cabinets.blogspot.com . 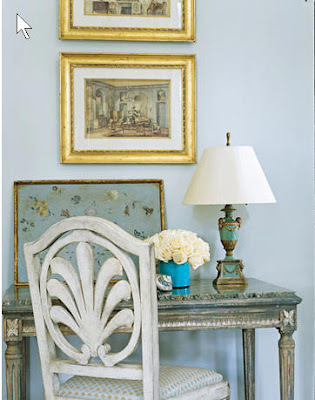 Does anyone know where to buy a skirted dressing table like in the pictures? 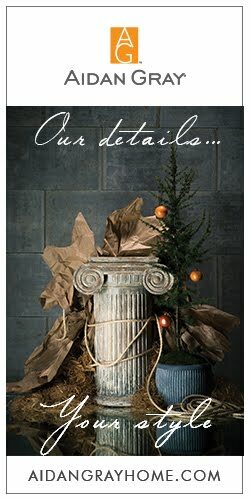 I don't know where you can get a fully skirted table but you can buy an unfinished vanity to skirt at Ready To Cover. Our kidney vanity tables are ready to skirt with any fabric and have pull out arms to make access even easier. 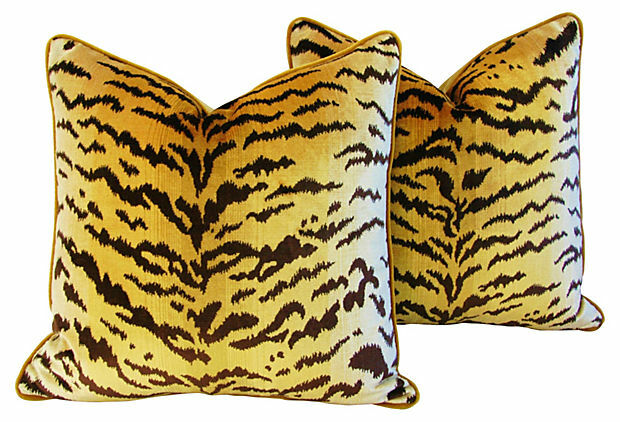 They are available in custom sizes and heights so you can choose one that best fits your room.